This third-term governor is rethinking healthcare and education with holistic, community-based programs. Oregon Governor John Kitzhaber is sitting in a second-floor conference room in downtown Portland’s World Trade Center, explaining the raft of education and healthcare reforms he’s pushing. He’s wearing his signature pressed blue jeans, brown tassled loafers, a white shirt, purple tie and dark blue woolen sports jacket. His gray hair is neatly combed, his mustache carefully trimmed. When he wants to illustrate a policy point on healthcare, he gets up, strides over to a white board and draws a graph showing the trade-offs between the willingness of doctors to absorb economic risks and the amount of time they spend on each patient. It’s mid-February. The next week, the governor will receive notice that his state is one of six to be awarded a prestigious State Innovation Model grant, worth up to $45 million, by the federal Center for Medicare & Medicaid Innovation, which was established under the Affordable Care Act. Oregon received the grant because of the reforms Kitzhaber’s administration has pushed regarding delivery of medical services. This is a story of focus, of a push by Oregon’s third-term governor (he held the job from 1995 to 2003 and was re-elected in November 2010, as the state struggled to overcome recession and fiscal crisis) to reinvent the way that government delivers core services, especially in healthcare and education. His aim is that, by 2025, 40 percent of the state’s high school students will go on to attend four-year colleges, 40 percent will attend community colleges, and the remaining 20 percent will graduate from high school or get an equivalency degree. Integrated funding mechanisms—some in place, some still under development—will back up these aspirations, and long-term timelines for reform will, the governor hopes, ultimately make Oregon’s population better educated and healthier. Kitzhaber has particular credibility on these issues: he’s not only a three-time governor but a former legislator and emergency-room doctor. He has earned a national reputation for thinking holistically and eliminating compartmentalized policy and funding silos that ought to be dealt with as parts of a continuum. In all likelihood, that was why he was invited to sit in Michelle Obama’s box during the 2013 State of the Union address; soon afterward, he was addressing the National Governors Association about his reforms. Only slightly tongue-in-cheek, Kitzhaber introduced into our conversation his grandiosely named Unified Theory of Everything. “The pathway to the American Dream,” he argues, in an e-mail he sends me shortly after we meet, “revolves around a job for which the individual is paid a living wage—enough to meet their basic needs—and an opportunity for upward income mobility. To create that pathway our public institutions (government) and our economy must be aligned around the same goal: to ensure an equal opportunity for all Americans to achieve their shared aspirations.” For Kitzhaber, poverty and ill health are too often the result of inadequate education; fixing these problems is what he calls the “left side” of his unified theory. On the right side, he talks about the need to invest in clean technologies and renewables, to open routes to prosperity that neither denude the environment nor leave millions unemployed. Kitzhaber has pushed the legislature to spend more on education in a drive to improve poorly performing schools. As his healthcare savings kick in, he hopes to add to those totals. And he isn’t just talking about K–12, but what he calls a “0–20 strategy.” In fact, it starts before birth, with prenatal counseling, and involves better nutrition programs, parenting classes and medical clinics in school settings. He wants to prepare all kids for kindergarten, have them reading at grade level by third grade, and get middle school kids ready for high school. He wants high school kids taking community college and university classes. Kitzhaber’s integrated model continues all the way through graduate school. Schools that meet those standards are labeled “model” schools, and are essentially given the funds and space to pursue their specialized projects. Those with poor success rates are categorized as “focus” or “priority” schools; the state assigns them “coaches”—retired administrators and other education specialists—who work with the principal and teachers to improve administration and classroom methods. These days, for example, it’s no longer enough for community colleges or universities to have lots of students enrolled in classes and picking up credits; now their graduation rates will be under the microscope. Ultimately, their funding levels will depend on graduation numbers. At the Gladstone Center for Children and Families (GCCF), half an hour’s drive south of Portland, the early-childhood pieces of the puzzle, on which all these other hopes rest, are already falling into place. There, in a converted 1960s Thriftway supermarket bought by the school district at a hefty discount back in 2005, more than 180 kids are concentrated in a stand-alone, full-day kindergarten, whose capacious windows look out onto fields and evergreen groves. Eighty local preschoolers also show up for Head Start sessions. And local families regularly attend afternoon and evening story times. Young adults attend parenting classes, and Clackamas Community College runs GED classes for Spanish speakers. The classrooms, ranged along a central hallway, are spacious, with kids seated around six-sided wooden tables, their art lining the walls. Outside is a playground centered around a large red, yellow and blue climbing structure. Off to its side is a garden, which kindergartners plant in the spring, leaving the harvest to next fall’s incoming class. At the far end of the campus, a medical clinic offers pediatric services, adult medical checkups, shots and mental health referrals. There are two dental clinics in the area, to which campus doctors refer patients. And in a nearby building, WIC vouchers are provided as a part of the hub of onsite services offered through the GCCF. Create enough healthcare/education/community center hubs like this across the state, and you’ve got a shot at realizing the 40/40/20 goals at the heart of Kitzhaber’s education reform. Add in better coordination between high schools and colleges, and you turn a possibility into a probability. On the eastern side of the state, at the opposite end of the education spectrum, Mark Mulvihill is the superintendent of an education service district that is coordinating the development of college courses in rural high schools at a fraction of their usual cost. Called Eastern Promise, the program operates in four rural counties often left behind by education reform movements. It’s the sort of opportunity that Kitzhaber hopes all pre-kindergartners currently entering the system will have in fifteen years. Two local community colleges and Eastern Oregon University are bringing their classes into local high schools, “so senior year in high schools becomes basically the freshman year in college,” as Mulvihill explains it. Oregon’s reforms are rapidly percolating into the mindset of educators, but they will still need more funding. After all, the state’s schools have been chronically underfunded for the past two decades. As in California, a tax revolt a generation ago, Ballot Measure 5, wrecked the ability of local governments to raise property taxes, loading $2 billion of unfunded education liabilities onto the shoulders of state government. At the same time, tough-on-crime measures have led to a 50 percent increase in the prison population over the past decade, with many predicting that the state will need to provide another 2,300 beds over the next ten years. Healthcare costs have similarly spiraled upward. As a result, per-student spending has plummeted as K–12 education has declined from 45 percent to 38 percent of the state’s general fund spending. Oregon’s school funding has been so low that in 2003 there was a derogatory Doonesbury cartoon on the phenomenon. “We have,” explains Kitzhaber, “been relentlessly pulling money out of investments in early childhood, children, families and education, and spending it on healthcare and public safety.” The governor knows he can’t get more money for education until he reforms these other systems. Kitzhaber has been talking about sentencing reform, although in the short term that’s likely to be a heavy lift. More immediately, he has pushed for ambitious healthcare delivery changes, beginning with the state’s Medicaid system, backed up by a federal waiver, along with nearly $2 billion in funding from Washington. He wants to use the savings to shore up a series of targeted, integrated investments in education, coordinated by Chief Education Officer Crew. This has meant moving more than 90 percent of the state’s Medicaid patients—about 600,000 people—into Coordinated Care Organizations, where primary care, wellness clinics, mental health centers, opticians and other services are either concentrated in one place or coordinated among the practitioners, allowing greater convenience for patients (dental care will be mandatory by July 2014). The CCOs’ budgets grow at a fixed amount per year, now at 4.4 percent and set to go down to 3.4 percent next year—less than the expected 5.4 percent per capita increase among Medicaid patients nationally, and enough to generate huge savings over a ten-year period. While they do have to build up rainy-day funds, they are encouraged to work within their budgets. If they mismanage their funds, the state can yank its contract with them. Since mid-2012, fifteen CCOs have been set up. Kitzhaber’s ambition is to adapt this model for the large insurance pools that provide coverage to teachers and other public employees, as well as for the state’s health insurance exchange, the Medicare system and, eventually, the private market. It is designed, says Oregon Health Authority director Dr. Bruce Goldberg, to simplify healthcare delivery and to focus more on preventive measures. “The engine of our current system,” he says, “is more care, not better health.” Goldberg takes one 10-year-old asthma sufferer and Medicaid patient as an example, talking about how the boy had been repeatedly hospitalized for expensive interventions over a several-month period. Then a caseworker went to his house, identified various substances that were triggering the boy’s asthma and helped his family rid the house of them. Since then, he has not had to be hospitalized once. He’s healthier, and the Medicaid system is saving money. The governor’s team estimates that by 2015, the cost savings will run to hundreds of millions of dollars annually. From there on, the savings grow still larger as the CCOs fully hit their stride. 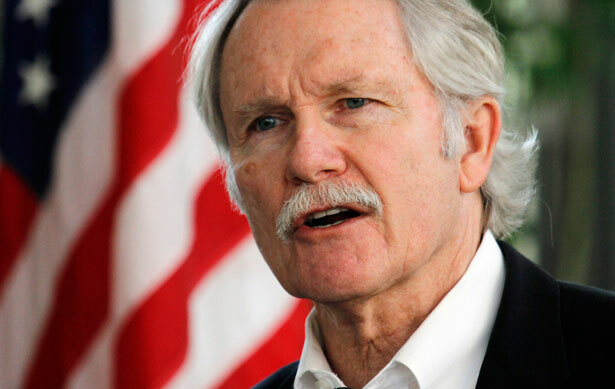 Expanding this model nationally for Medicaid, Medicare and dual-covered patients would, Kitzhaber estimates, save the country $1.9 trillion over ten years, $1.5 trillion of which would represent federal savings. Even for Congress, he announces sardonically, that’s “real money.” It’s a way to start dealing with the deficit and national debt without decimating vital services, while also making Americans healthier. This isn’t about big versus small government; it’s about clever government. It’s about using limited resources combined with new technologies effectively, and it’s about rewarding schools and health systems that generate good outcomes rather than those that simply throw resources at their problems without planning or coordination. In the May 13 issue, Sasha Abramsky wrote about one of the youngest and poorest senators, Martin Heinrich of New Mexico, who rose to the top as a supporter of labor and environmental issues.